Amartya Kumar Sen, is an Indian economist and philosopher, who since 1972 has taught and worked in the United Kingdom and the United States. Sen has made contributions to welfare economics, social choice theory, economic and social justice, economic theories of famines, and indexes of the measure of well-being of citizens of developing countries. He was awarded the Nobel Memorial Prize in Economic Sciences in 1998 and Bharat Ratna, the highest civilian award in India, in 1999 for his work in welfare economics. In 2017, Sen was awarded the Johan Skytte Prize in Political Science for most valuable contribution to Political Science. 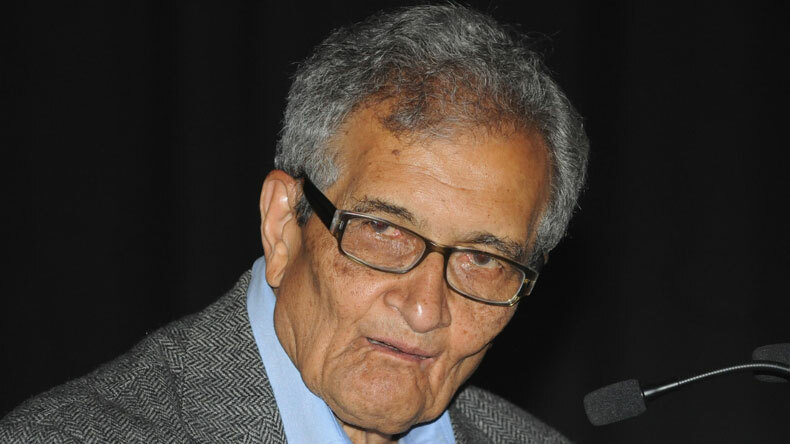 Amartya Sen was born on 3 November 1933, in a Bengali Kayastha family in Santiniketan in West Bengal, India, to Ashutosh Sen and Amita Sen. He was named Amartya by Rabindranath Tagore. Sen had his schooling at Dhaka in 1940, and then at Patha Bhavana, Santiniketan. In 1951, he enrolled in Presidency College, Kolkata, where he graduated in Economics. While at college, Sen was diagnosed with oral cancer, and he survived with radiation treatment. In 1953 he got admission in Trinity College, Cambridge, where he graduated in Pure Economics in 1955. Sen began his career when he was a Ph.D student at Cambridge, he was offered the position of Professor and Head of the Economics Department of the newly created Jadavpur University in Calcutta (Kolkata). He served as Head of the Department of Economics from 1956 to 1958. Sen was elected to a four-year Prize Fellowship at Trinity College, and he decided to study philosophy. In 1959, Sen chose a different subject for his Ph.D. thesis, which was on “The Choice of Techniques”. Between 1960 and 1961, Sen was a visiting Professor at Massachusetts Institute of Technology, UC-Berkeley and Cornell in the US. Between 1963 and 1971, he taught as Professor of Economics at the Delhi School of Economics. He was also a frequent visiting professor to premiere Indian economic schools like Jawaharlal Nehru University, Indian Statistical Institute, Centre for Development Studies etc. In 1972, he joined the London School of Economics where he taught until 1977. From 1977 to 1986 he taught at the University of Oxford. In 1987, he joined Harvard and in 1998 he was appointed as Master of Trinity College, Cambridge, and in 2004, Sen returned to Harvard. In 2007, he was appointed as chairman of Nalanda Mentor Group which helped the establishment of Nalanda International University Project as an international centre of education. In 2012, Sen became the first chancellor of Nalanda University. However, in 2015 he withdrew his candidature for a second term. Sen’s work complemented that of Maurice Dobb and the Dobb-Sen strategy for developing countries. It relied on maximising investible surpluses, maintaining constant real wages and using the entire increase in labour productivity, to raise the rate of accumulation. Sen’s papers in the late 1960s helped develop the theory of social choice. This came into prominence in the work of American economist Kenneth Arrow. Sen was called the “conscience of his profession”, and “the Mother Teresa of Economics” for his theories on Welfare Economics. Sen’s contribution showed under what conditions Arrow’s impossibility theorem applied, as well as to extend and enrich the theory of social choice. In 1981, Sen published a book, Poverty and Famines: An Essay on Entitlement and Deprivation. He argued that famine occurs not only from a lack of food, but from inequalities built into mechanisms for distributing food. Sen also argued that the Bengal famine was caused by an urban economic boom which raised food prices, and since the rural workers’ wages were not raised enough it caused millions to starve to death. Sen had witnessed the Bengal famine of 1943, as a nine-year-old boy. Three million people perished. Sen presented data that there was adequate food supply in Bengal but rural landless labourers and urban poor could not buy food as its price rose rapidly. This was due to British military acquisition, panic buying, hoarding etc. According to Sen, in many cases of famine, food production and supplies were not significantly reduced. This was true also in case of Bengal where food production was higher than in previous non-famine years. Thus, a number of social and economic factors, such as declining wages, unemployment, rising food prices, and poor food-distribution led to starvation. His capabilities approach focuses on positive freedom, a person’s actual ability to be or do something, rather than on negative freedom approaches. Sen’s work in the field of development economics had considerable influence in the formulation of the “Human Development Report” which is published by the United Nations Development Programme. Sen’s revolutionary contribution to development economics and social indicators is the concept of “capability”. This was developed in his article “Equality of What”, where he argues that governments should be measured against the concrete capabilities of their citizens. In 1998, Sen further elaborated on his capability approach in his book Development as Freedom; in which he argues that development should be viewed as an effort to advance the real freedoms that individuals enjoy, rather than simply focusing on metrics such as GDP or income-per-capita. Before Sen’s work, these had been viewed as only the ends of development; luxuries afforded to countries that focus on increasing income. However, Sen argues that the increase in real freedoms should be both the ends and the means of development. 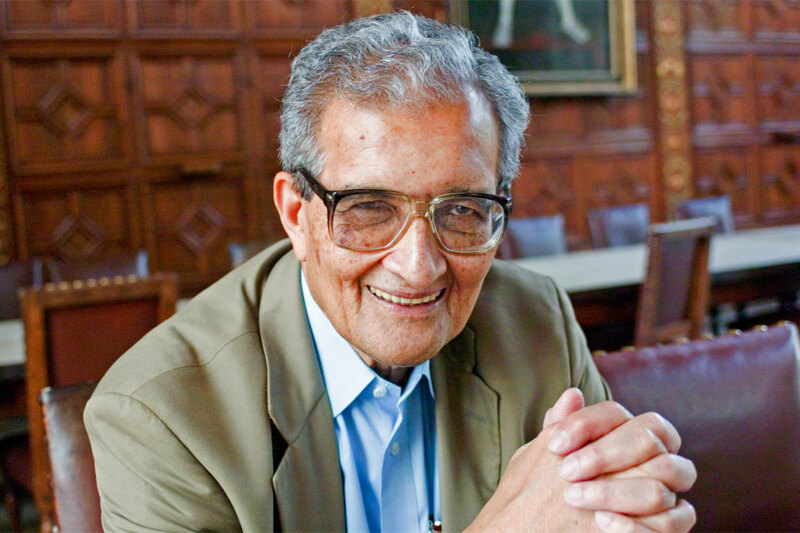 Amartya Sen is the top Economist in the world and has received numerous honours, awards and accolades. He has received over 90 honorary degrees from several universities around the globe. Beginning with the Adam Smith Prize in 1954, there is a long list of awards that he has received. 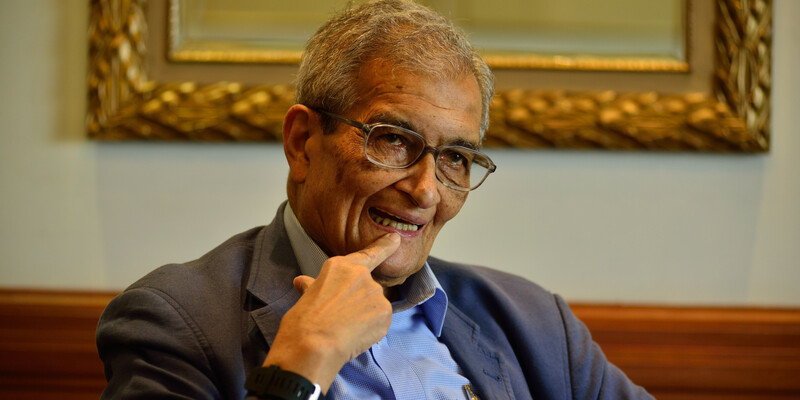 Amartya Sen is currently the Thomas W. Lamont University Professor at Harvard and also a member of faculty at Harvard Law School. He will continue to enlighten the world with his brilliance in Developmental and welfare Economics.